Jesus said to the followers, "When you pray, pray like this: 'Father, we pray that your name will always be kept holy. 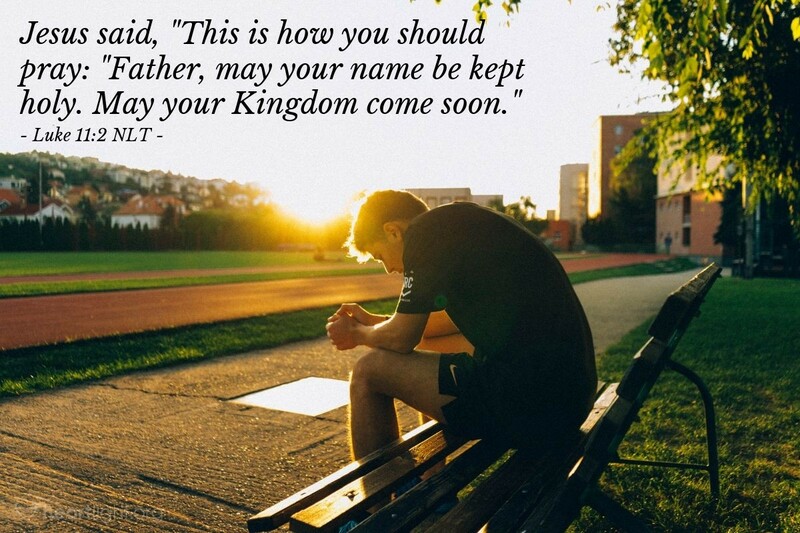 We pray that your kingdom will come.'" Prayer begins with two realities. The first reality is that the Almighty God, holy and majestic, eternal and all powerful, longs for us to come to him as his children. The second reality is that God our Father calls us to enter into a relationship where his will and his way set the direction and the meaning of our lives as we voluntarily offer ourselves as subjects of his Kingdom. This means that our hearts' deepest yearnings are to come into the presence of our Father and to see the dawning of his unrestrained and untainted rule over all things. Prayer is the perfect place to experience his presence and to anticipate this great day of his complete reign over all things. Prayer is also the place where we affirm to the God we love that he is our Father, that we want his name and character to be honored in all the earth, and that we live in anticipation of the day when Christ brings all his glory to full view. Such few words to express awesome truth; yet these words, this relationship, and this future are ours in Jesus! Holy and tender Father, it breaks my heart to hear your name so violated by profanity and by mere flippant exclamations. Please bring about a deeper reverence for your name by bringing the rule of your Kingdom into full and glorious view with the return of your Son. Until that day, dear Father, please empower your church, that island of your Kingdom in view, to more powerfully display her reverence for your name, her desire to draw close to you, and her passion for the day of your Son's return. In Jesus' name I pray. Amen.